Amanda M. Schreiner: What Shelby Said Wednesday - What Victoria Said - Be Nice Me! 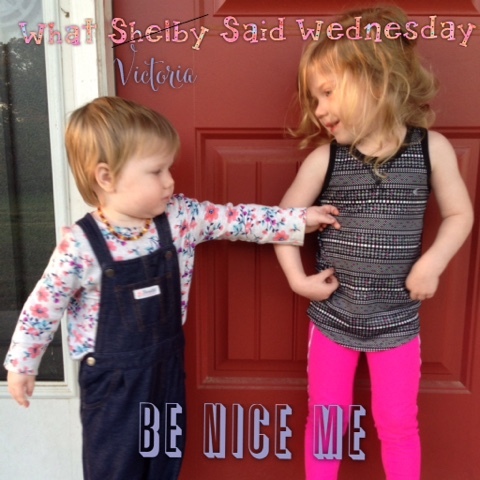 What Shelby Said Wednesday - What Victoria Said - Be Nice Me! I know, I know ... Victoria has been doing a lot of taking over lately. Her language is just exploding so much every day! As is her understanding. She astonishes me every day with what she understands. The past week or so she has started telling us "Be nice me!" Sometimes it sounds like "Be nice to meet me!" Often it is accompanied by "Stop!" or "Lea me lone!" Sometimes it is obvious there has been some kind of physical altercation. Sometimes it is when her feelings get hurt. She's almost 2 years old ... it happens a lot. Just this morning she was crying and borderline out of control in unhappiness after I took Shelby's milk away from her and told her not to pour it on the floor. When I tried to console her Shelby told me "Your hurt ALL her feelings! All of them!" Just after that we were (finally) eating breakfast and Tori started pointing around the table and declaring (loudly) "Shelby! Be nice me! Daddy! (He was already gone to work?) Be nice me! Mommy! Be nice me!" She also already understands that sometimes things can be said that aren't nice. Both girls were coloring one day last week and Shelby said "Momma look at my pretty coloring!" Mommy: "Yes Shelby that's beautiful! I like how you use so many different colors!" Shelby: "Yes I color so good! Tori not color so good." Victoria: (can't you just picture her scowl?) "Be nice me!" So we are already having to have talks about comparing and about having nice things to say about others. We all could stand to be reminded to "be nice me."